According to the inventory of the early 18th century, the 'Ivan the Great' complex included 34 bells, half of which were used, while the other half missed the tongues. Since the bells were destroyed due to the fires and falls, the most ancient ones preserved in the Kremlin date back only to the 16th century (though it is known that bell founder Boris the Roman cast five bells already in 1346—probably for the Church of Saint Jonh the Climacus, built under Ivan Kalita). 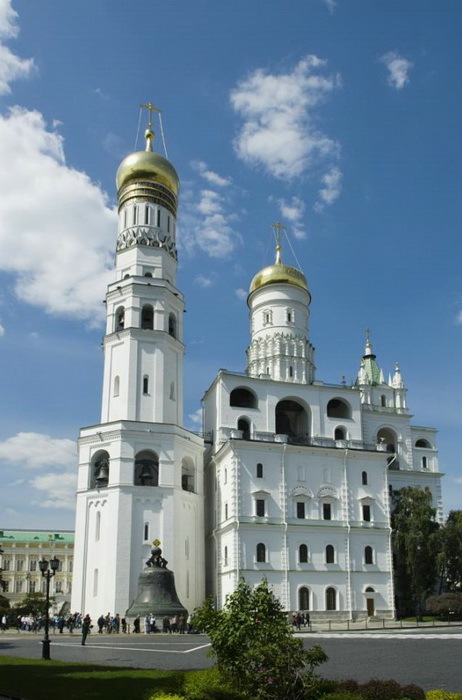 Three most magnificent bells of the Kremlin can be seen on the belfry. Central aperture locates the Uspensky bell—second largest bell after the Tsar Bell and the largest among working ones. Moscow craftsmen Yakov Zavjalov, ninety-year-old patriarch of the foundry, and a bell-founder of the 14th rank Rusinov, who worked at the factory of merchant Mikhail Bogdanov, recast the bell in 1817-1819 from the old one damaged through the explosion. 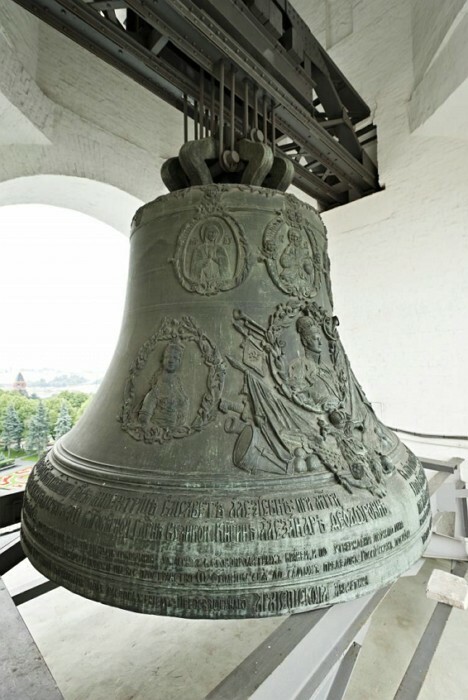 The body of the bell is decorated with cast images of the Deisis, Dormition of Our Lady, tsars Alexey and Peter, Emperor Alexander I and his family, as well as Moscow Archbishop Augustin. 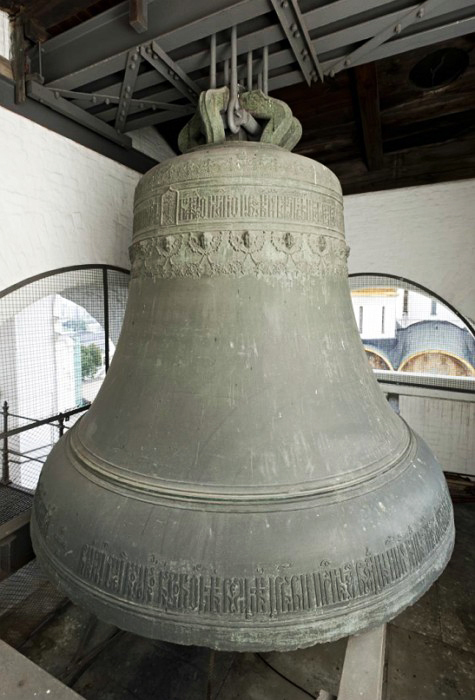 The bell-tongue weights 1.750 kg, while the bell itself weighs about 64 ton. The enormous size of the Uspensky (i.e. Assumption) bell caused concerns: possessor of the bell-casting factory merchant Bogdanov had hardly received permission to raise it to the bell-tower. For this purpose, a special tower was erected by the bell-tower. When the bell was raised to the middle of the necessary height, someone shouted that Ivan the Great was swaying. The crowd began to panic—probably this was done on purpose by swindlers encroach other people’s pockets. But everything turned out well and the bell took the intended place. The bell tolled only on very solemn days and the great feasts, while merchant Bogdanov, who donated a fair amount of money for the bell cast, came to the belfry and sat dawn on the stairs, listening and weeping for joy1. Another large bell is called Reut (i.e. howler—a bell with low and hard sound). Weighing more than 19 ton it was produced upon the order of Tsar Mikhail Fyodorovich in 1622, by Andrey Chokhov, author of the Tsar Cannon. After the fall caused by the explosion in 1812, it lost its canon, but after the repair, its sound did not change. However, more than 40 years later, during the solemn peal dedicated to the enthronement of Alexander II in the Kremlin, the Reut fell down, breaking through the belfry vaults and killing several people. In this regard, Metropolitan Philaret foretold the unfortunate end of Alexander’s reign. 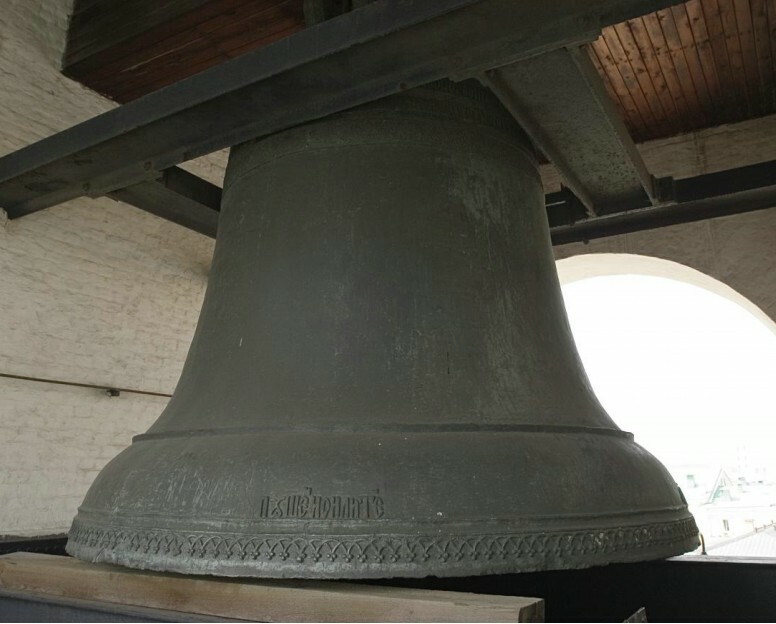 The third large bell, weighing over 16 ton, was mentioned in the documents by the names Semisotny, Velikopostny, Voskresny (i.e. seven hundredths, Lenten, Resurrection). Its sound timbre was so beautiful, that composer A.G. Rubenstein specially came in order to listen to it. This richly decorated bell of the Philaret’s annex, cast at the beginning of 18th century by Ivan Motorin, sounded during the Lent.